The national health insurance company of the United Arab Emirates Daman can look forward to a fantastic future with its new headquarters in Abu Dhabi. Its data network is already equipped for upcoming technologies today and opens up some amazing options. Application: Structured cabling solution with OM3 FO backbone and Cat. 6A ISO copper cabling in an 18-story office complex. Use of 10 Gigabit Ethernet. Can be directly migrated to 40/100 Gigabit Ethernet. Automated Infrastructure Management (AIM) can also be integrated. The health insurance company Daman has not yet celebrated its tenth birthday. It was set up in 2006 to offer a range of health insurance plans to people in the region. It soon became apparent that the citizens required the services of a public health insurance. 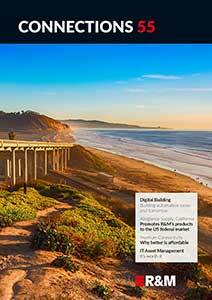 Daman also developed insurance plans perfectly tailored to market requirements. Its success means the company is growing constantly. Daman already has more than 2.4 million customers which is why it had to move into new headquarters. It is an 18-story office building on Hamdan Street in Abu Dhabi. Over an area of 21 000 square meters (230 000 sq ft), the building is ready to provide all opportunities for further growth. A key factor was to install the perfect IT infrastructure. Because the data network has to be capable of growing long-term with the company over a number of years. Daman chose to work with long-term partner R&M. The main reasons for this were unrivaled Swiss quality, the reliability and comprehensive modularity of the cabling systems as well as the professionalism of the local R&M team. In this special case, the customer was also impressed by the amazing future-ready options. Although initially the point was to enable network operations with 10 Gigabit Ethernet (GbE), the customer was able to look forward to quite different potential at the end of the day. The optimal cabling solution for the application of 10 GbE turned out to be the Class EA / Cat. 6A range from R&M as this fulfills the stricter requirements of the ISO/IEC 11801 standard. For example, it offers exceptional safety margins for signal transmission. Daman deliberately chose the higher quality technology. The specialists at Daman found it remarkable that the Cat. 6A connection modules from R&M could easily support transmission frequencies of up to 650 MHz long term. This is considerably higher performance than other products used in the region. Furthermore, OM3 FO cabling from R&M was used for the backbone. The cabling in the new Daman headquarters is suitable for much more than just current 10 GbE applications. It already offers all options for the later use of 40 and even 100 Gigabit Ethernet. The insurance company can thus sit back and wait for the future to come with the investments it has already made. Migration will be easy to carry out as soon as growth makes it necessary. The modular principle of the R&M cabling system allow fast, uncomplicated adaptations. Major modifications in the distributors are unnecessary. And another factor is making a major contribution to a fantastic future: The network can be retrofitted with the Automated Infrastructure Management System (AIM) R&MinteliPhy at any time. The components can be added in next to no time. 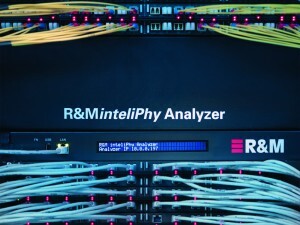 R&MinteliPhy enables the automatic control and management of the entire cabling infrastructure. In addition, R&MinteliPhy also supports the smooth migration to 40/100 GbE once the components have been installed.